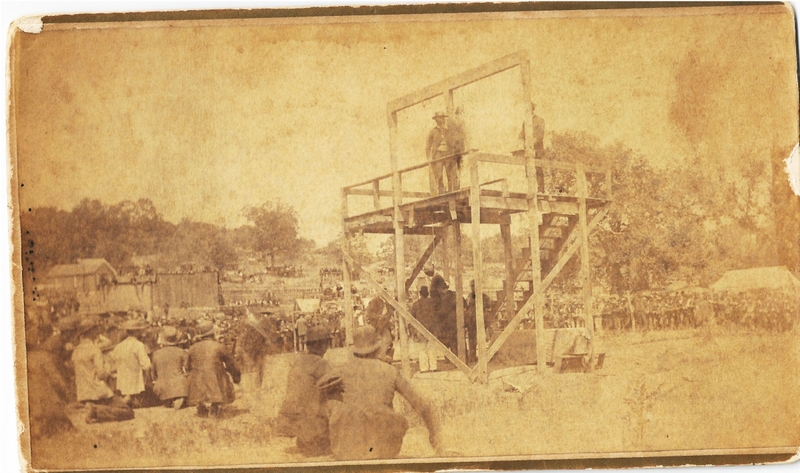 Gallatin paid tribute to perhaps its most historic moment in 1992 when the Gallatin Theater League resurrected apsects of the 1883 Trial of Frank James. 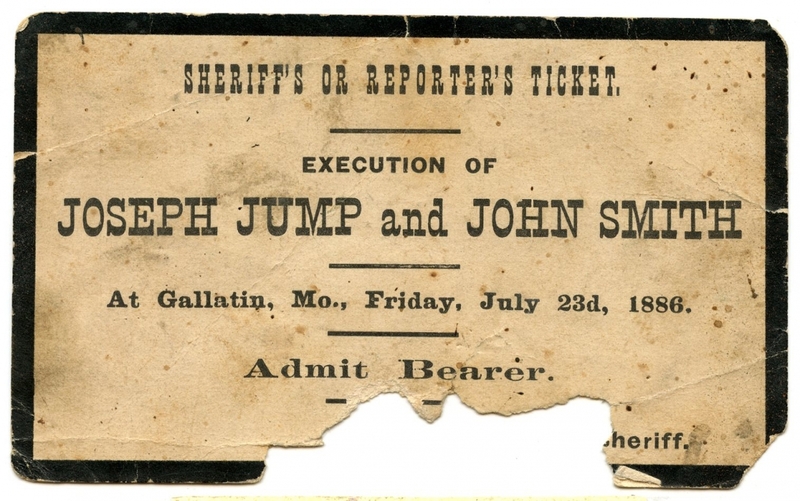 The re-enactment, financed in part through the Missouri Arts Council, was the first ever performed here — over 100 years since the most famous trial of the Wild West unfolded in an opera house on the west side of the Gallatin business square. The script was composed by Gallatin newspaper publisher Darryl Wilkinson. 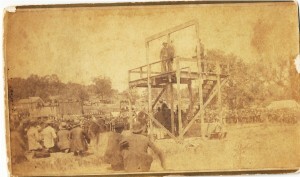 The idea spawned by an alumni re-enactment held during the 75th anniversary celegration of the UMKC School of Law. 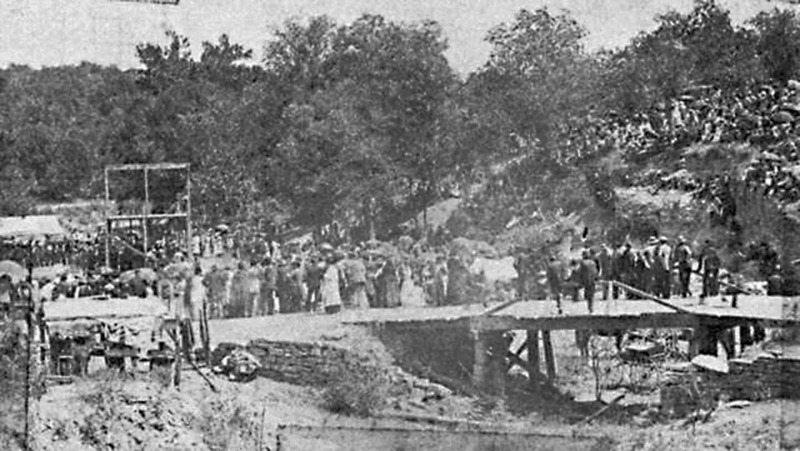 The idea was nurtured by numerous people sharing reference books with staging suggestions inspired by the annual outdoor pageant “The Life & Times of Jesse James” produced at Kearney, MO. Script preparation spanned parts of four years. 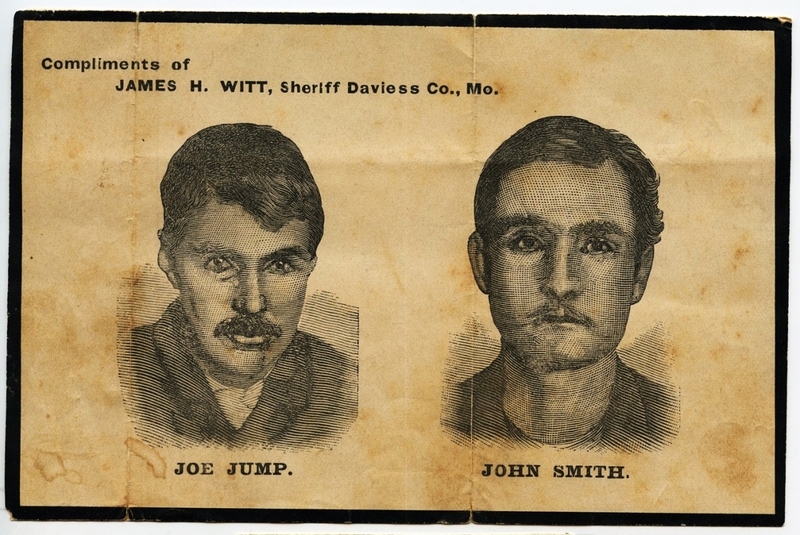 Several trips to the archives of the State Historical Society at the University of Missouri-Columbia campus yielded dividends, including photographs of the jurists and many of the key witnesss involved in the 1883 trial. 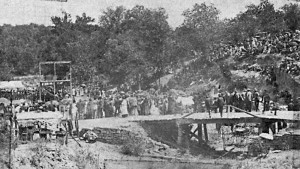 The trial re-enactment became reality through the efforts of 52 performing volunteers (40 males parts alone) under the experienced and capable direction of Sandy Evans and Barbara Wilson. The production far exceeded its 90-minute intended length. Yet, the audience never seemed to mind. The smallest of acting parts carried the potential for viewing interest. A few seats in Courter Theater went unclaimed opening night, but by Saturday’s finale even those seats vacated by the 12 tapped for jury duty were resold. 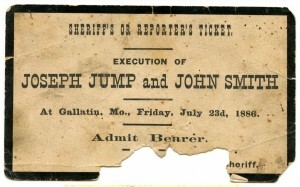 Articles about the production, which appeared in the St. Joseph News-Press/Gazette, brought people from Savannah and Liberty although publicity was mostly local. Ballads by Mike Arnold were highlights ab both the beginning, intermission, and close of the production. Humor spiced subplots which provided background information and meaning to trial scenes. Freeze action scenes helped main characters divorce themselves from th play to talk directly to the audience and jury. Randy Johnson provided lighting effects crucial to the production on the small Courter Theater stage. Videotape filmed during dress rehearsal and all three performances were edited by Arnel Bruce, using a sound track by Ken Lockridge. Steve Stout excellently portrayed Gen. Joe Shelby to open the second act. Keith Gay as Judge Goodman, Tim Peery as Prosecutor Wm. Wallace, and Tom Garnett as Counselor Phillips all mastered lengthy parts in convincing style. Steve Adkison as newspaperman John Edward Newman and Tammy Gay as Zerelda Samuels (mother of Frank James) also performed well. 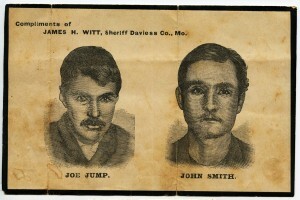 These were the main characters, along with Mike Bohannon as Frank James. The $870 spent on costuming helped the audience step back a century in time. There were surprises for the audience. Twelve men were randomly tapped for jury duty as they prepared to take their seats. At the direction of Judge Goodman, Jim Weldon as the sheriff lifted gun holsters from some in the viewing audience. Zerelda Samuels made her entrance from the balcony, protesting the trial proceedings against her son even before it started. A liquored Gen. Shelby, likewise, initiated Act II from the audience and drew laughs by casually remarking upon some of thes he passed by, including a compliment on (Steve Stout’s own) children during one performance. Other surprises were from audience reaction. The barber shop scene proved to be a favorite with the antics of Stan Ellis wiggling his cigar while his face was enshrouded with a shaving towel. Allan Lunsford’s lines about witnessing the Winston train robbery were authentically accurate, not fiction. His character, Thomas Brosius, did exaggerate and was later exposed as an unreliable witness on the witness stand. Another line drawing audience laughter was factual rather than fiction, when Gen. Shelby explained he never surrendered to the Union Army but instead went to Mexico. He really did, leading nearly 1,000 men before abondoning the notion and returning to Missouri. Most information departed through the re-enactment can be linked to fact. The “B.C.” scene is a notable exception. The return of frequent and beloved Gallatin Theatre League characters Maude, Mama and Essie to the Courter stage assured that the re-enactment would not be void of theatrics. The skit uses a familiar plot of miscommunication whereby the “B.C.” is simultaneously thought to mean “Baptist Church” and “bathhouse commode.” Nancy Garnett plays here Mama characer to the hilt, even when she forgets and leaves her cane backstage. The list of characters is long, and the accolades which are appropriate here could be much longer. Several participants were making their acting debut — Jerry Stewart, Jack Lynch, Steve Evans, Charlie Belshe, Larry Belshe, Krissy Hogan, Janet Sehrt, Steve Bohannon, Nick Walker, Vance Hefley, Mike Bohannon, Brice Terry, Frank Woodruff, Anita Toney, Greg Houghton, Mike Abel, Chris Elbert and perhaps others.